When teachers and student feel comfort able producing on their own, we know we are doing our job. Here Mr O'Donnell at Foshay Learning Center takes over instruction and assists students in production. The New Year Starts With A Bang. 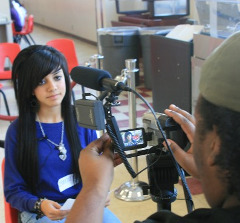 Both Foshay Learning Center and Augustus Hawkins high school have partnered their new journalism classes with the Media Aid Center to provide online, podcasting, video, and print distribution technologies. Training and production supervision will be provided by Media Aid Center staff in the creation of a school and community media portal. Mr. O’Donnell and Ms. Castillo are the lead teachers at these two programs. They guide the creative process of writing and editing the material that will become a part of their schools media website. The media Center has provided cameras, editing systems, website hosting, and a podcasting station for reporters and the school anchors to develop the material. Together we have great plans for this collaboration. We are looking for speakers to interview, places of interest, events and happenings in the Los Angeles area to excite our reporters and audience. The Hawkins football team intends to put together its own video crew. And both schools are creating an afterschool young producers club to allow all school students have an opportunity to participate. We are currently in the process of getting the afterschool program accepted as a for credit class by the school administration. The Media Aid Center has built entire programs for high schools such as Jordan and Fremont high school. Those classes were during school and for credit. The center wishes to continue supporting the schools by providing a curriculum acceptable within school parameters for the development of new media producers and journalists. Both schools intend to podcast school announcements to students and parents are weekly and then daily basis. The first broadcasts are expected in November with a monthly overview on the last Friday of every month. Each media center takes about $80,000 to setup and run. Each school radio station costs about $5,000. Your donations, equipment contributions, ideas, and help to complete these facilities will create a resource that will serve students for years. We know we can count on you.